This is the vaporizer I built that you've seen me use in my livestreams, previously known as Project A, now to be called the G43. What does the name stand for? What's different and special about this one? It's simple, it's strong, and it's cost effective. I would say this can technically be categorized as a desktop vaporizer, but it can also be fairly portable if you'd like to use it as a cordless vape around your home. The G43 is like some other desktop vaporizers in that you need to pair it up with a glass rig or j-hook to actually use it, there is no mouthpiece or stem included. 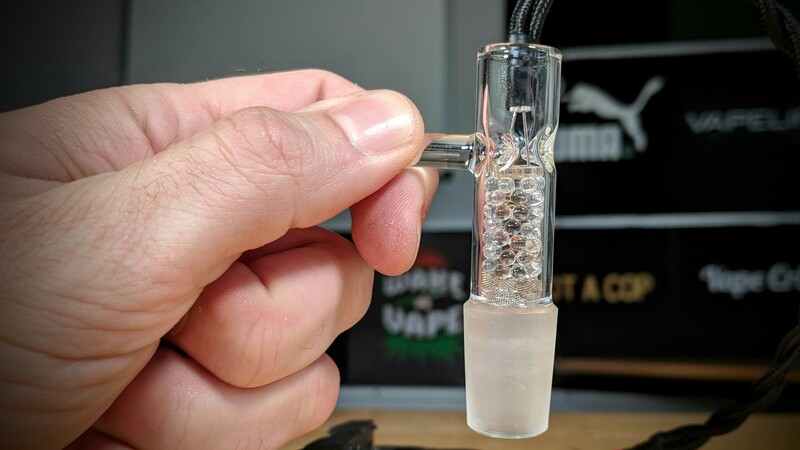 The end of the slide is a standard 18mm male connection so you need to pair it up with an 18mm female rig. If you only have a 14mm female rig I will have adapters available as an add-on. If you don't currently have any glass rigs you will be able to add on an 18mm glass J-hook to your order, it works great with it and it's super simple. 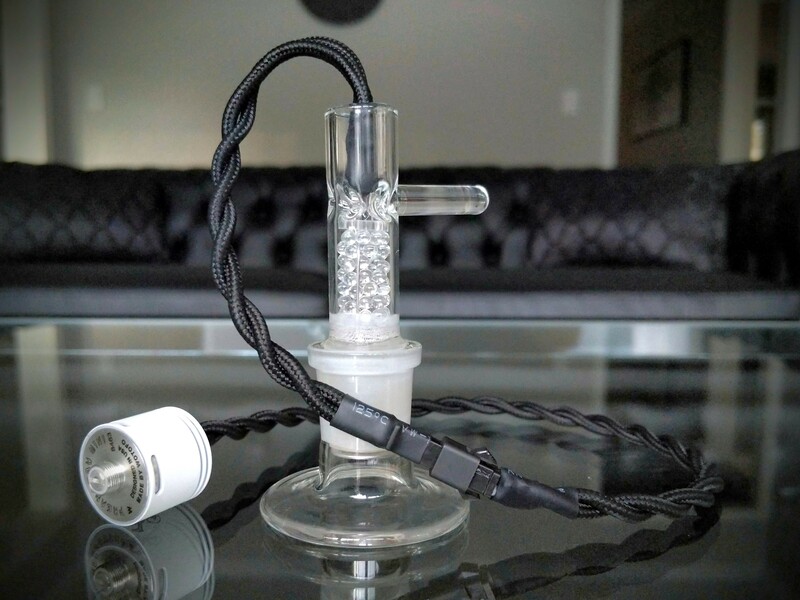 Otherwise, if you want a nice quality cheap glass rig, my go-to is the Stereo Matrix rig that NewVape sells for $60 (shown in my video clips), and you can also find very similar rigs on dhgate that are under $100. The G43 heater is powered by a box mod controller, which is easily hooked up to the vape with the included RDA connector. Custom firmware is then installed onto the mod (easy) which enables the "auto fire" feature, allowing the mod to stay on for an extended period of time for "session" vaping. 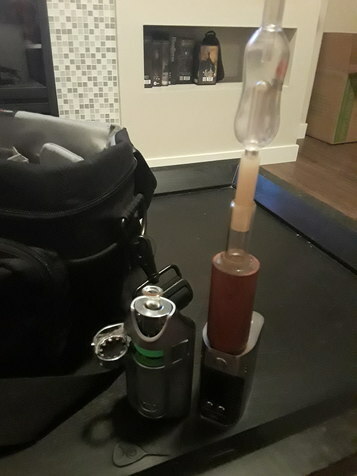 A typical session for me with this vape is right around 8 minutes long. 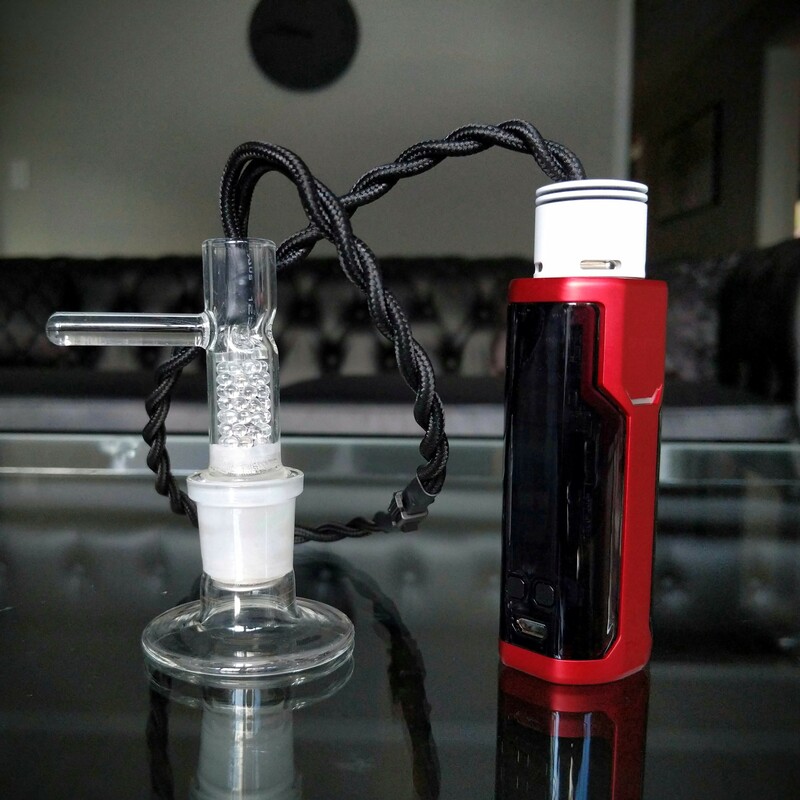 The mod I'm using it with now is a Wismec P80 which is a single-18650 battery mod, but you can also use dual battery mods if you want to extend how long you can vape with it, like the RX GEN3 Dual. I bought 100 P80 mods that I have in stock for the first 100 people who don't have one and need to add it on. Check out the Mods & Firmware FAQ thread for more information about this. Other vapes I like a lot that inspired this creation and influenced my design are the Glass Symphony, Elev8r, and Tubo Evic. How much is it and where can I buy one? This project was mainly to see if I could create a heater that actually worked, and then when I did get it working I knew it was something you guys had to try for yourselves. So this basic heater-only model that you need to use with a rig is my first base model that I purposely wanted to be as simple as possible. Then once you guys have had a chance to use it and provide feedback for me I can start integrating those ideas into the next upgraded version. Once the G43 heater is perfected to our liking, I want to move my main focus to shrinking things down to get it all inside a portable unit the size of a medium box mod. I have an alpha version of this built that works and produces vapor, but it needs a ton of additional work to be a real vaporizer that can be sold, so it's on the back burner at the moment. If you'd like to be added to the G43 waiting list please post in this thread and let me know! You'll be notified via PM when your turn is approaching, we're currently shipping units to people in the order in which they were added to the list. I believe I'm all ready on the list. Just saying. I’d love to join the list please. Hey bud this is Felix, the 3d design person. I would love to be on the list please. Count me in. It's BernieCat aka Angie. :smile: Take my money already! put me on the list I'll buy it. Please let me know when this joint is available!!! I need this in my life! That's a lot cooler than my vape I designed about 2 mins ago. Time to buy the ticket and take the ride! Me too. I am looking forward to trying it out! 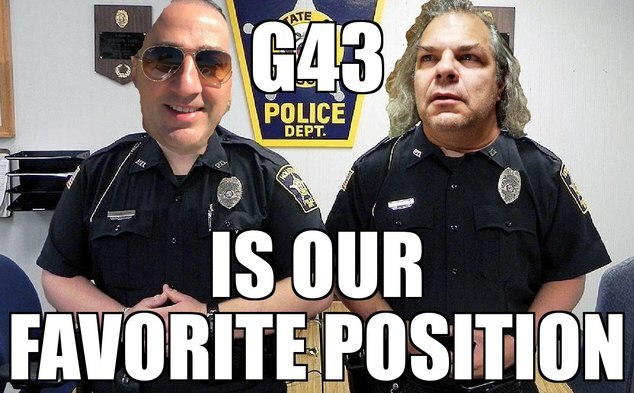 I'll take a g43 and a j pipe. Berniecat!!! I didn’t realize you weren’t on the forum already!! :heart: So glad you joined! What size diameter is the g43? I want on the LIST! @VapeCritic can you put me on the list please. Any plans to ever make a version that could just plug into the wall? As in a non portable all day no worries about batteries ripper? we need more hazel dancing in videos and streams!! I agree this would be an instant purchase for me. Whats up dude i would love to be on the list and im a long time viewer and need a potent vape! Hit me @... Basskilla420atgmaildotcom ! Stay up bud!! !